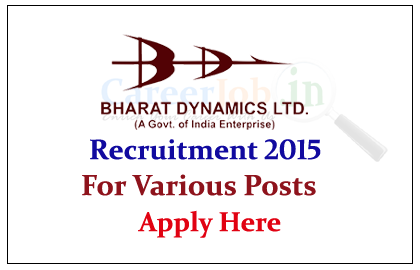 Bharat Dynamics Limited (BDL) is recruiting 2015 for the post of Contract engineers / Senior contract Engineers / Research Associates for the year of 2015. Eligible candidate can apply online here on or before 26th June 2015. Bharat Dynamics Limited (BDL) was established in the year 1970 to be a manufacturing base for guided weapon systems. Its coming into being reflects the visionary wisdom of the Nation to achieve self-reliance in the technological domain. Eligible Candidates can apply online from 13.06.2015 to 26.06.2015, for more details check official Notification.